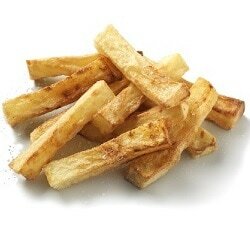 Peel the potatoes and cut each into 1.2 cm thick fries. Soak the potatoes in water for at least 30 minutes. Drain them thoroughly, then pat them dry with kitchen paper. Put the potatoes in a large bowl, drizzle with the oil and toss to coat them. Transfer them to the Airfryer basket. Slide the basket into the Airfryer and set the timer for 18 minutes. When the timer rings, slide out the basket and shake the potatoes. Adjust the temperature to 180°C and set the timer for another 12 minutes. After 6 minutes, slide out the basket and shake the potatoes again. Fry until the timer rings and the potatoes are golden brown. Sprinkle with salt and serve on a platter.